I have made this bracelet using nickel free silver plated chain to comply with EU directives. Adding a bottle of fairy dust, a protrait of Tinkerbell and an enamel Tinkerbell charm. The glass beads I thought were very fitting to Tinkerbell's fantasy style and I have included a crocodile charm with an alarm clock too. There is a ships wheel and pirate flag charm, but just to enhance the bracelet a little more I have added a little bell that will tinkle. Please note the central pendant charm may be different from the one shown. 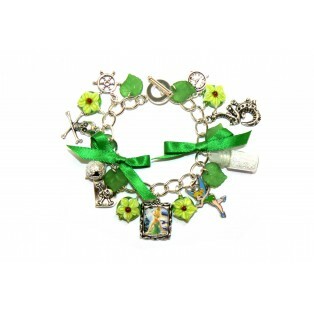 A perfect gift for a woman that loves the fantasy world of Tinkerbell and Peter Pan.